An account of the overwhelming role of drug-taking in the Third Reich -from Hitler and his entourage to ordinary troops. In this highly original book, a bestseller in Germany, Norman Ohler shows how the entire Nazi regime was permeated with drugs. This chemical euphoria changes how we should think about the Nazi high command and its ability to understand the situation it found itself in by 1944-5. 'The most brilliant and fascinating book I have read in my entire life' Dan Snow'A huge contribution... remarkable' Antony Beevor, BBC RADIO 4 'Extremely interesting ... a serious piece of scholarship, very well researched' Ian KershawThe sensational German bestseller on the overwhelming role of drug-taking in the Third Reich, from Hitler to housewives.The Nazis presented themselves as warriors against moral degeneracy. 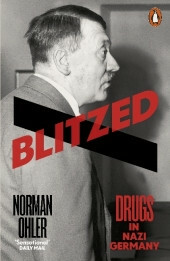 Yet, as Norman Ohler's gripping bestseller reveals, the entire Third Reich was permeated with drugs: cocaine, heroin, morphine and, most of all, methamphetamines, or crystal meth, used by everyone from factory workers to housewives, and crucial to troops' resilience - even partly explaining German victory in 1940.The promiscuous use of drugs at the very highest levels also impaired and confused decision-making, with Hitler and his entourage taking refuge in potentially lethal cocktails of stimulants administered by the physician Dr Morell as the war turned against Germany. While drugs cannot on their own explain the events of the Second World War or its outcome, Ohler shows, they change our understanding of it. Blitzed forms a crucial missing piece of the story.